Early June saw changeable weather hit the area, with a light dusting of snow on the Cairngorms in the second week! The long days however, provide the opportunity for 20 hours of birding for those with the stamina to attempt it! With all the migratory bird species now back in the area we have seen bird day-lists approaching the 70 mark, many of them with recently fledged young, with mammal day-list usually between 6 & 9 depending on our luck. A couple of amazing track-side close-ups of Woodcock - giving us the chance to admire the wonderfully cryptic plumage of this usually very elusive bird. Good views of Red Grouse families on the Heather moorland, some with as many as 8 well-grown youngsters. A 'bonus' view of a splendid male Capercaillie up a silver birch tree, discovered by accident as we were observing an Osprey in an adjacent tree! Nice close-ups of singing Wood Warblers - not a common bird in these parts - their whole bodies quivering with the effort. Several sightings of Cuckoos being 'seen-off' by Meadow Pipits - the Pipits obviously very aware that they are a favourite species for the Cuckoo to parisitize! Good views of Osprey in their nest, with the fluffy, grey youngsters seemingly growing bigger every day (see pic). The second half of May saw the warm, dry weather continue and the last of the expected migrant bird species such as Dotterel and Whinchat appear in our area, and this combination of good weather and a near 'full-house' of Summer wildlife, of course, made for perfect safari conditions! Bird day-lists hitting the high 60's for the first time this year and mammal day-lists usually between 6 & 9 depending on our luck! 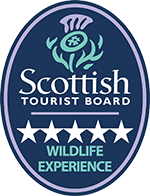 BBC Springwatch featuring the Cairngorms National Park as one of their featured locations, with Simon King 'spreading the word' about Speyside being a great place for watching wildlife and their wonderful footage backing up his claims. Good dawn views of an Otter fishing on the River Spey - a great way to start the day! Huge herds of Red Deer seen grazing on the fresh Spring grass on the floodplains of a beautiful upland glen - a magnificent sight. A walk up to the summit of Cairngorm Mountain - the physical exertion being well rewarded by reasonable views of Ring Ouzels, Mountain Hares and Ptarmigan. The first new-arrivals for some of our local speciality species - with the first Red Grouse and Osprey chicks being seen at the end of the month. Unusually good views of a Crossbill family in one of our local forests -the birds, for a change, feeding part-way up a tree rather than at the top - giving me a better opportunity to get some decent photos (see pic). A day-trip to the SWT's lovely Handa Island reserve off Scotland's spectacular North West coast producing super views of many nesting seabird species such as Arctic & Great Skuas, Razorbills, Guillemots, Fulmars and everbody's favourite, the Puffins. We also had bonus mammal encounters with Seals, Harbour Porpoises and a Minke Whale! A great day out in beautiful surroundings - highly recommended!